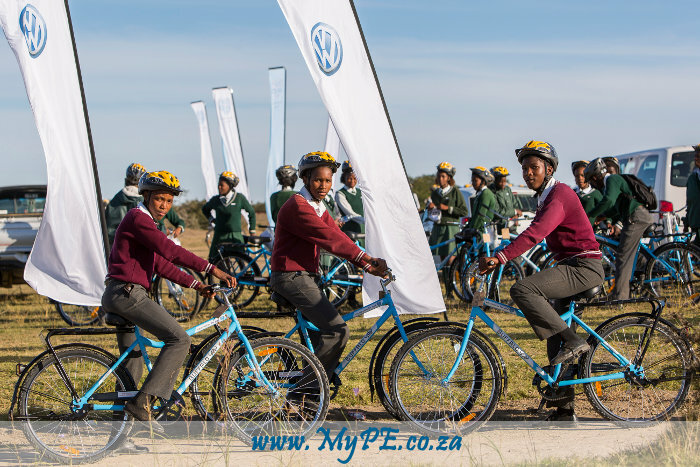 Volkswagen Group South Africa (VWSA) has continued its partnership with Qhubeka Bicycle Education Empowerment Programme (BEEP) by sponsoring six young cyclists as they prepare for the Telkom 947 cycle challenge being raced in November. These six school children were among the winners of the 2016’s Bergville Cycle race. They were initially treated to a two-day trip to Durban to celebrate their achievement and to be spectators at the Tour D’Urban cycle race. This trip was the first step on the road to a once in a lifetime opportunity for these children to compete in the Telkom 947 Cycle Race. For these six novice cyclists to commit to an undertaking like competing in one of South Africa’s most challenging road races is no small feat and Volkswagen is not taking its responsibility in this endeavour lightly. A local coach has been appointed to train the cyclists and over the next six months VWSA will ensure that these cyclists receive proper training and nutrition. They will also prepare by attending specialist cycling camps and competing in races leading up to the Telkom 947 Cycle challenge. This training and preparation will help the young Volkswagen cyclists get to grips with their new equipment as well as race fitness. The partnership between VWSA and Qhubeka has always been about empowering the communities. Therefore one of the most tangible benefits from this partnership is the time bike recipients gain to do the things that matter most to them. For these 6 cyclists what matters most is becoming competitive cyclists. But for most of the bike recipients it simply gives them more time to learn, play, spend time with their families and the time to just be a child. “We trust that through having received a bike and training, as well as the opportunity to race in the Telkom 947 Cycle Challenge that these 6 budding South African cyclists will be inspired to work hard for what they want. Also by taking part in this Cycle Race they will hopefully inspire other young bike recipients to dream big.” said Thomas Schaefer, Volkswagen Group South Africa Chairman and Managing Director.